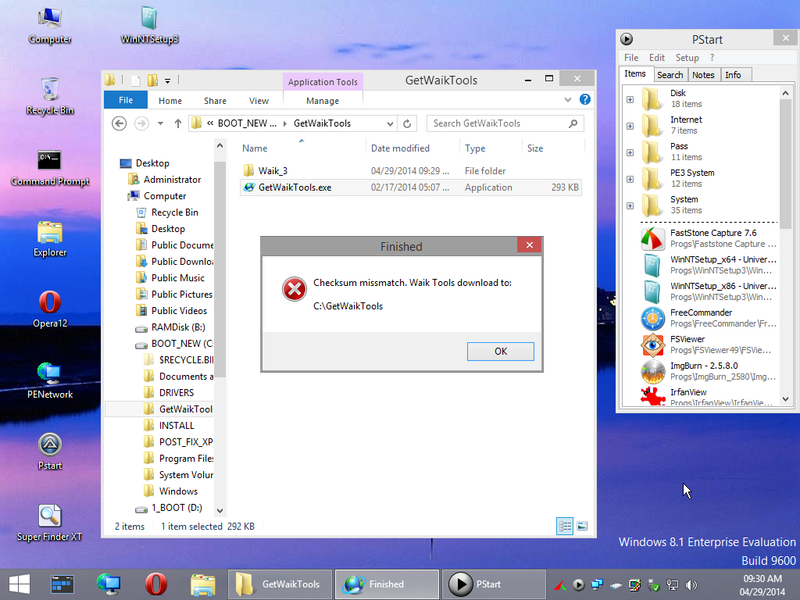 After booting with Win8.1SE and then using GetWaikTools.exe is giving Checksum missmatch error. The Tools are not available in that case. that's properly a missing ADVPACK.DLL in system32 (or syswow64 on x64 PE). I'll drop this dependency in some future version. It is in system32 for 32-bit build. Hmm, if anyone can give me a valid reason for ADK update than yes. But as far I can see it, all changes of the Update are only for the WimBoot feature. I can confirm that adding the file + mui solved the issue. For both keys, there is also DCSettingIndex to change the timeout on battery, if needed. I made a new plugin "Power options", to choose the timeout for monitor and hard disk when Plugged in or on Battery. I do not want to talk more about Hi ren's. It has many free application but also some illegals like mini XP which is moreover deleted when processing the plugin. The plugin is here as is, without the ISO and files and nothing more, I'm sure you understand . Otherwise for shortcuts, you mean those of HBCD or others startmenu shortcuts also. The shortcuts are created at startup and the target is checked before creating, as far as I know ! unless you are using makeshorctus plugin. Can you give me some examples with the target of the shortcut and location of the actual file ? For untouched HBCD plugin you should have the shorcut target with Y:\HBCD\HBCDMenu.exe and the exe present in Y:\HBCD folder. So it is related to your Win8.1se CD or rather USB3, I guess, which is not recognized at startup and so not (re)mounted on the Y: drive. I guess you also have a Warning Icon on the desktop, it is a shortcuts to MountPEmedia.log . Can you try by replacing 1-files.script in the build folder and to rebuild, if it brings something. 1 - Copy Files: choose the user logo. drvmain.sdb driver compatibility file added to fixed some USB3 issue. 2 - Shell & Config: Add a3x association, Pintool 1.2.4: Pin to Classic Shell 3.5.1 and 4, thanks neon2m. ProductOptions changed for x64 build to disable activate windows watermark after 3 hours. Adjustments, improvements here and there.